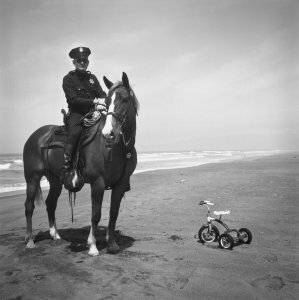 SAN FRANCISCO -- We don't often attend a museum exhibit of a 23-year-old's photographs. But these photos were taken in San Francisco 48 years ago. 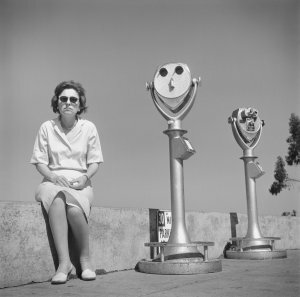 And the photographer was Arthur Tress. Adobe, oddly enough, hosted this private showing of "Arthur Tress: San Francisco 1964" at the de Young Museum in San Francisco, a collection of decidedly non-digital images by a photographer who doesn't own Photoshop. Industry luminaries like Stephen Johnson and Bert Monroy as well as members of the Photoshop and Lightroom teams attended. So we were also able to get a few insights into products like Photoshop Touch, which are in our review queue. But the big attraction was Tress himself, who talked about his work and walked us through the exhibit to discuss some of the images. He took these images just a couple of years after graduating from Bard College when he visited his sister Madelaine, eight years older than him, who at that time was a marketing executive at Fireman's Fund here. He picked a good year to visit. It was 1964 with the 28th Republican National Convention at the Cow Palace one month and the Beatles launching their first North American tour from the same venue shortly after. 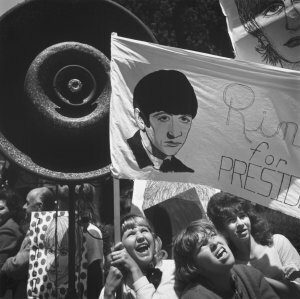 The contrast wasn't lost on the young Tress, who photographed young people with "Ringo for President" signs at the convention. He'd brought along his twin lens Rolleiflex and used his Brooklyn moxie to sneak into the convention, snapping shots without making a nuisance of himself, sometimes holding the camera over his head so his subjects wouldn't suspect anything. It was also the year that the long row of auto dealerships on Van Ness was targeted with protests over hiring practices that relegated blacks solely to janitorial positions. Those protests were among the first to show how effective a tool the sit-in could be for social change. And Tress was there to photograph it. While some of these images certainly pass for photojournalism, Tress didn't stop there. He had thought of his work as "interpretive travel photography" but pushed that concept to include "a very large dose of social commentary and criticism." He consciously shot, for example, very distorted images of huge outdoor portraits of Republican candidates George Romney and Nelson Rockefeller in which their jaws appeared large and their brains tiny. Inspired by Walker Evans, he wanted to use photography as "a creative method of social criticism." So, like Evans, he took a wider view of the people he shot to include their environment as well. There are images of signs and small shop windows in the exhibit of more than 70 of the over 900 images he took during his six month stay here. Like other photographers of that era, Tress was self-taught. He learned the craft mainly through photography magazines, he said. But he also spent a lot of time in the Bard art library. Among his more important influences, he cited Edward Steichen's Family of Man, Eugène Atget's images of shop windows, Henri Cartier-Bresson, Robert Frank's The Americans and William Klein's New York 1954-55. Unlike the street photographers he studied, all of whom shot with small 35mm cameras, Tress preferred the medium format Rolleiflex. 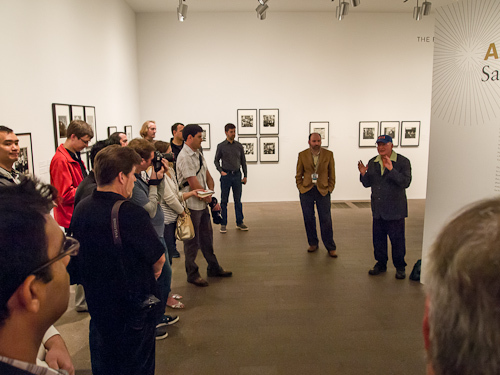 He developed the Plus-X film in the public darkroom of the Harvey Milk Photography Center in the Castro (which still exists, offering classes in digital photography as well as a public darkroom). And he made prints there, too. Which he left behind at his sister's when he left town. When she passed away in 2009, he was cleaning out her closet when he rediscovered 15 vintage 11x14 prints mounted on 16x20 mat board from that visit. The prints had been exhibited at the Tides bookstore in Sausalito and shortly after in Mendocino before being put away all these years. Tress had new contact sheets made of the 1964 images and brought them to James Ganz, curator of the Fine Arts Museums's Achenbach Foundation for Graphic Arts. Ganz said Tress really undersold them as "maybe interesting for the ladies' hairstyles." Instead he was "floored because it's an incredibly powerful, mature, important body of work." Which also hadn't been published. A real find. So he spent a couple years putting the exhibit together, which runs through June 3 at the de Young Museum. The catalog is dedicated to Madelaine "with heartfelt appreciation for all the years of unlimited support and careful guidance that helped make me the artist I am today." Tress speaking to the group with Ganz to his right. The images in the exhibit themselves were only printed in 2010 as selenium-toned gelatin silver prints from the original negatives by Steven Rifkin, master printer at Hank's Photographic Services. Rifkin is Tress's printer these days. Although Tress did make the original prints at the public darkroom in the Castro (two of which, mounted on orange and green fluorescent poster board, are in the exhibit), Tress doesn't make his own prints any more. And while the Rolleiflex is gone, he's only shot with a Hasselblad and "one or two lenses," he said. He won a Sony Alpha dSLR a couple of years ago, but "it's still in the box." And no, he doesn't use Photoshop (but suggested if Adobe gave him a copy he'd endorse it) or Lightroom. He does work on an iMac to create his photo books, however. His bookstore on Blurb, in fact, has about 25 titles. As Ganz explained in his introductory remarks, Arthur is hard to categorize. "Some of these photographs are very odd. And some of them are humorous. Some of them are just weird." All of them were undocumented, though, making Ganz's task a little more difficult. But many of the locations of the images have been divined for the show. "How many of you know my work?" Tress asked, surprised to see half of the crowd raise their hands. 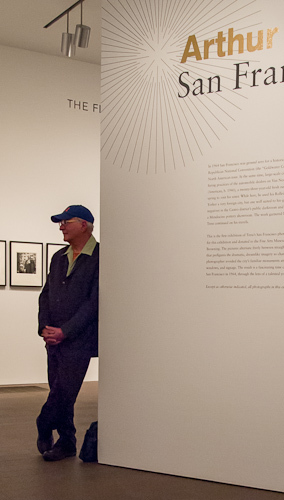 Some people, he complained, think "photography history starts with Cindy Sherman." He explained he still uses that Hasselblad, "which is an analog camera," and sends his negatives to a lab in Los Angeles, which returns the film and contact sheets to him. They "last a very long time. And are always retrievable," he joked. He also gets scans that he puts on his iMac to make his photo books and even his archive through Blurb.com. "It's really all about your imagination," he confided. 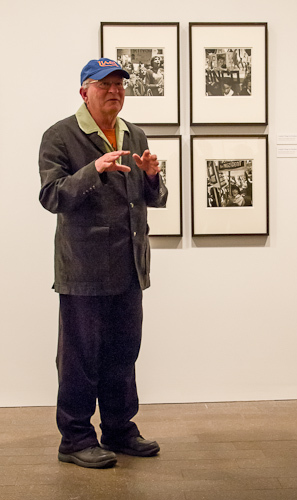 He described the work on display as a kind of 1960s photography of "social documentary with political overtones. You felt you could make the world a better place." 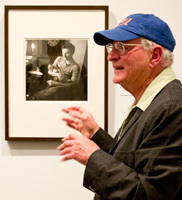 And that meant photographing not just people but the paraphernalia around them, as he learned from Walker Evans. The displays in the windows of small shops, the graphics, the signage. He was very much aware of the WPA photographers when he did this work, he added. After discussing his influences, he described his approach. He shoots, he said, and disappears. He does not interact with the people he photographs. "I just take their picture quickly and then I'm gone." Often with the camera above his head, as if he isn't shooting the scene he sees. That explains why some images on the contact sheets in the catalog and on display are upside down. That was the approach he used in 1964 and it's still his way of working. He shot his most recent book on skate parks in California that way, in fact. Some of the images were staged, he noted. The woman in sunglasses sitting next to a coin-operated binocular at Coit Tower obliging lifted her head to match the angle of the binocular. 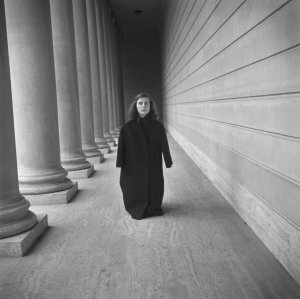 And the woman in a cape kneeling in the colonnade of the Legion of Honor is Joan Benson, a musician friend who needed an album cover. As Ganz said, they're odd, humorous and just weird, too. But the more you look at them, the more they reveal. About San Francisco, about 1964, about what's changed -- and about what hasn't.